1How old do I have to be to play? As of current, NSW law requires you to be 16 years of age to play paintball. 12 Year Olds are slated to be allowed to play on July 1, 2019. We only require a completed Parental Consent Form for those 16/17 to play! If you have a completed parental consent form, you CAN play! 2Do the games still go ahead in wet weather? Prices vary, however normally start from $49.00 per person and go to $189.00! Check out our paintball packages available. Each package comes with all the gear you need to play such as a standard paintball gun, mask, overalls and ammo harness (harness not available with Sentry Package), so there are no hidden costs. 4Do I have to pay a deposit? NO. Deposits are completely optional, but we do recommend paying them as it will guarantee your selected date and time (non deposited groups are subject to availability). Paying deposits will also qualify you for organiser bonus. Deposits are $30 per person and must be paid at least 48 hours prior to the day of play. Call us on (02) 9679 0011 to pay. We can also send you a PayPal request or you can pay deposits with a credit card during the online booking process. 5Someone Pulled Out, Do I Lose the Deposit? Unfortunately, yes the deposit is lost and cannot be used for other things like extra paintballs, upgrade guns, or packages. You can get a refund 48 hours before your game if you need. Think of them like tickets to an event. 6How is the day organised? What can I expect? Make a booking with us either online or by calling (02) 9679 0011 and select your preferred playing date and starting time. Please ensure you and your group are on site at least 15 minutes prior to your start time. Your group will then watch a quick safety video and then will sign in with their Photo ID, or parental consent form. Once processed, collect your gear and have a quick Facebook photo then it’s out to play and get your gun! How long can I play for? 7How long can I play for? You have until 4pm to play. As long as you have ammo (extra ammo can be purchased at any time), you can play from the time you start until 4pm. The earlier you start, the more play time you have. 8How do the games work? If I get shot once, am I out? Each individual game runs between 10 and 15 minutes and you will play a number of these throughout the day. Each type of game has its own rules which your referee will explain before you begin. The basic game type will see two teams try to eliminate each other within the time limit. Re-spawn is available usually up until the last five minutes of play – meaning if you get hit, walk back to your start area, then immediately rejoin the game. The last five minutes of the game is ‘elimination’. This means if you get hit, you are out until the start of the next game. Again, your referee will explain all the rules before you begin. 9How do I book a game? You can either book online here or give us a call on (02) 9679 0011. Its very fast and easy to book online and pick your start time! We have two great fields. Our primary location is in Rouse Hill, which is open 7 days from 9-5pm (games finish at 4pm). The Yarramundi field is only open for bookings of 14+ deposited players. Why play at Action Paintball Games? 11Why play at Action Paintball Games? There are many great reasons to play with us at Action Paintball Games! 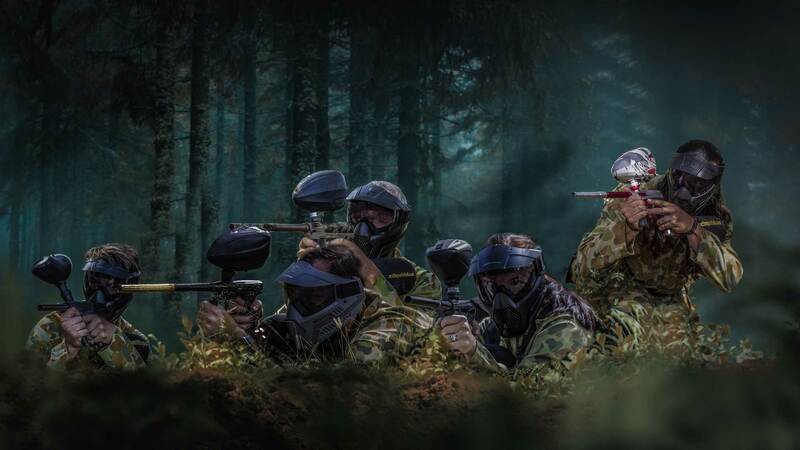 From our great value paintball packages, amazing selection of gun upgrades to our HUGE scenario game Total War, and our professional tournament series, the Super 7’s Series, we’ve got something for everybody! We will supply you will camouflage overalls to wear. Underneath the overalls, we suggest wearing only light clothing, such as shorts and a shirt. Avoid heavy clothing like jumpers and long pants. The idea may appeal to you to reduce the impact of a paintball hit, but in reality, it will just increase the chance of overheating and your paintball mask fogging up. Absolutely. Glasses will fit comfortably under our rental paintball masks. We use only the latest model extremely comfortable antifog BASE GS-F rental masks for all of our customers. Only if you don’t follow the safety rules! Paintball is one of the safest activities out there. Industry standards like approved paintball masks, thorough safety briefings for players, and limits on paintball gun velocities help prevent injuries. 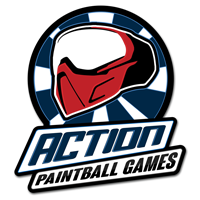 Also, Action Paintball has highly trained referees to ensure that everyone follows the rules and stays safe while having maximum fun! 15Do the paintballs Stain Clothing or Shoes? The paintballs do not stain clothing or shoes as long as you wash your clothes as soon as possible and dont let the paint sink in. It is a fully washable water soluble paint that is not designed to stain. Just wash with water after you play and there is nothing to worry about! 16OK, so paintball is safe, but doesn't it hurt? Sometimes. It depends on where it you are hit, whether it breaks or not (balls that just bounce of tend to be more painful), and what kind of clothing you are wearing. All paintball markers at Action Paintball Games shoot under the legal limit of 300 feet per second and we enforce a 3 meter ‘surrender’ rule. Sometimes, you won’t even feel a hit. But, even when a shot does hurt, it’s usually just a quick sting – the kind of thing you say ‘ow!’ about, and then forget about a few seconds later. When the adrenaline takes over, you’ll barely notice. In fact most people are upset only because they are actually out of the game rather than from any pain. At its essence, paintball is a competitive game played for the same reason as any other competitive game – to win. It requires specific gear (goggles, a gun/marker, pressurized gas and paintballs) so you can safely shoot at others and be shot at. Paintball is like a more challenging, high-stakes version of laser tag, hide-and-seek or capture the flag. Beyond that, paintball is hard to describe. It can be played with as few as 2 people or as many as 500. A game can last 5 minutes or 24 hours. The objective might be to take something, bring something, find something or simply be the last person standing. Depending on the field you play, tactics will vary as well. A paintball game will be different every time, but there’s one thing guaranteed when you play at Action Paintball Games: an adrenaline rush. 18I have never played before? Will I be 'out-gunned'? No experience is necessary to have a fun day with us. Physical size and fitness play little part in a game of paintball as it is the guns that do most of the work for you. Special attention is given to beginner players with beginners’ games, along with top-line rentals, to guarantee that a fun time is had by all. From the beginner to the best pro players in the country, Action Paintball Games has you covered. 19Do You Have Showers On Site? YES. We have 4 Male showers an 1 female shower on site to get you ready for the next part of your day! Just bring a towel and your own shower cleaning gear! 20I have played a few times and love it, how can I take my game to the next level? We not only run social games at Action Paintball, but we also run Australia’s largest scenario game, Total War. Imagine 400 players spread across our entire Rouse Hill park. There is smoke, pyrotechnics, objectives and much more. Medals and prizes for the Most Lethal Player, Best Dressed and more make Total War an amazing experience for any player. Or perhaps you want to experience the fast, structured pace of Tournament Paintball with the Super 7’s Series. The novice division is a great starting place – Organise your team of 3 and compete with other novice teams for trophies and prizes. All equipment (gun, mask and overalls) is provided to novice teams. You just pay entry to the event and buy paint for your team. 21What are your Bank Details? 22I have Paintball Tickets, can I Use Them at Action? Terms & Conditions: You must read and accept the following terms and conditions of play. We reserve the right to modify these terms and conditions at any time, without prior notice. Yes, I have read and agree to all terms and conditions listed below. Only pre-booked groups are guaranteed a session. Non pre-booked groups are subject to availability on the day. Only deposited groups can start before 9.30am, non-deposited players must start after 9.30am. Please note all games must finish by 4.00pm each day, so if your group is late you may be reducing your total game time on the day. Groups starting outside of the 9.30am to 4.00pm playing times may be subject to and out of hours surcharge. Organizer and player paint bonuses are only for players who have paid deposits 48 hours in advance of their booking date. Groups who arrive more than 1 hour after their start time forfeit any bonuses. We are very strict on this so please make sure your group is on time! Groups that arrive more than 1 hour outside of their booked start time may have an extended wait for processing as priority must be given to groups who arrive on time. There is no refund or transfer of deposits for players who do not show on the day of play (we require 24 hours’ notice for refunds or cancellations). Only groups with 20 or more deposited players are guaranteed their own private game. 20 deposited players MUST be onsite at the time of the group being processed or they do not qualify! We do not count players who are 'still coming' and let the group play alone until they arrive. All players over 18 years of age MUST bring Photo ID. An Australian Driver’s license or RTA Photo Card is best. Be advised, we cannot process any group where no one in the group has some sort of approved photo ID. All players must be over 16 years of age in NSW. All players under 18 must supply a signed parental consent form from our website to prove their age. Persons unable to prove their age will not be permitted to play. If all players in the group are under 16 years of age, an adult must remain on site in the undercover area to be responsible for the players. It's the responsibility of the organiser to make sure their group and player bonuses are taken in full by the end of the day’s play. Unused bonuses and paintballs cannot be transferred to another day and are not redeemable for cash or goods. NO eskies or drink coolers allowed. We will allow unopened beer cartons to be brought on to the site, however we will hold it in our fridge until all members of your group have finished for the day and returned all of their rental gear (including their RFID player bracelet). 24Can I get my own private group? Yes you may, you can have 20 or more deposited players and your group will play amongst themselves free! If you have less than 20 and would like your own private group please call us to inquire about the own referee surcharge. 25What is the minimum amount of players we need to play paintball? 1! We can take your booking and get you playing with other people no worries! Weekends are super easy to get you and a few mates playing with a larger group of people, weekdays are subject to availability.